Why hasn't Main Street recovered like Wall Street? If the five-year recovery from the Great Recession were a stereotypical college party, Wall Street would be the cool jocks drinking beers while everyday Americans would still be waiting for their invitations. Frustration over the uneven economic rebound is understandable. Stock prices have nearly tripled from their lows in 2009 and continue to shatter records. Meanwhile, the "real" economy remains painfully pedestrian. Why have the past five years only increased the divide between Main Street and Wall Street? Look no further than the Federal Reserve stimulus measures. "Monetary policy is a blunt instrument, not a surgical tool. It's much better at inflating assets than creating jobs," said Kristina Hooper, U.S. investment strategist at Allianz Global Investors, which manages nearly $500 billion in assets. Main Street misses the ride up: There's little question the Fed has been among the biggest forces behind the Dow's 10,000-point climb. With banks scared to lend and Congress unwilling or unable to inject additional fiscal stimulus, Ben Bernanke & Co. were left with little choice but to unleash monetary policy. The Fed's moves stabilized the financial system and encouraged bigger investors to get back into the market since putting money in the bank yielded almost no interest. Of course, many Mom and Pop investors had already cashed out as they watched their retirement funds evaporate. While hedge funds and billionaires scooped up beaten down stocks, less affluent Americans didn't have the tolerance or resources to buy companies like Apple (AAPL) at truly historic discounts in 2009. In fact, fewer Americans have money invested in the stock market now than a decade ago, according to Gallup. 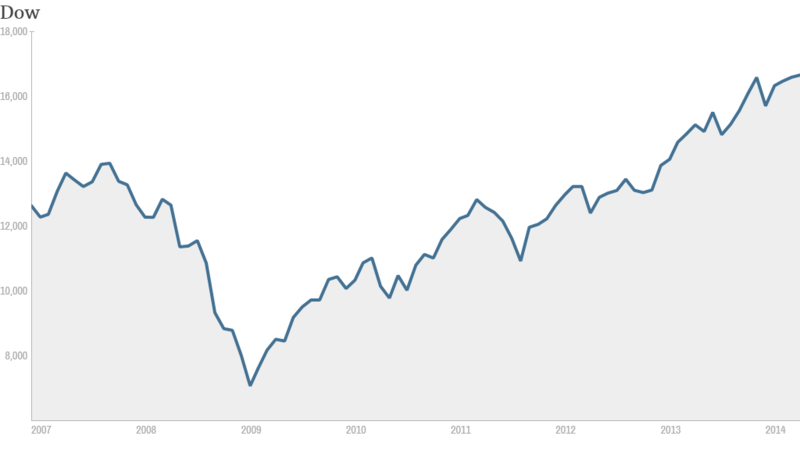 CNNMoney wants to know: Did you benefit from the big stock market rise? "Only a small group has participated in this recovery. While we have made a lot of progress, it has been unevenly distributed," said Hooper. Sluggish job, wage growth: Corporate America is also operating at extremely lean levels as the memories of the crisis linger. That means some companies like Hewlett-Packard (HPQ) continue to cut costs -- a business way of saying eliminating tens of thousands of people's jobs. The U.S. has almost recovered the jobs lost in the Great Recession, but it's been a slow rebound. While companies are always expanding or contracting, the hiring hasn't kept up with the job trimming. Businesses simply expect the remaining employees to work harder. All of this explains why some parts of the economy have returned to their pre-recession levels, private sector employment has not. 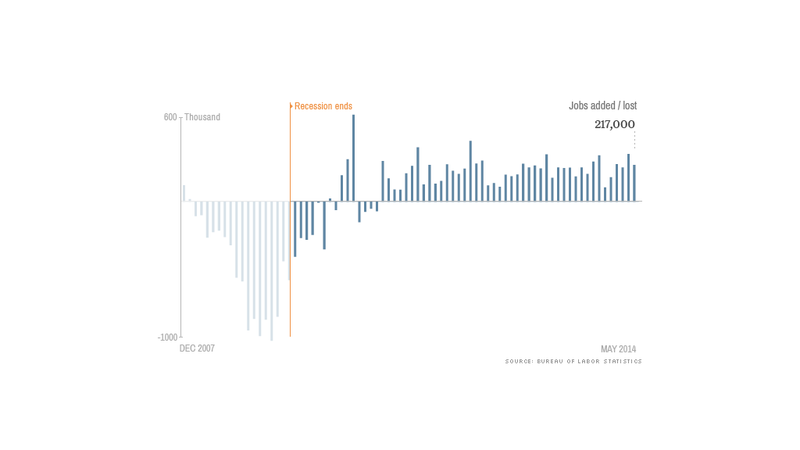 Even more alarming, many of the jobs that are created pay less than the ones lost during the recession. Real average hourly earnings for all U.S. employees decreased 0.3% in April from March. Some companies are also scared to spend due to a lack of visibility over regulatory, health care and tax policies out of Washington. "There is a vast array of uncertainty, which impedes the ability to plan. It's tough to navigate in a fog -- and that's what has descended on businesses in America," said Lawrence Creatura, vice president and portfolio manager at Federated Investors. Corporate America hoards cash: While many companies have done well since 2009, returning to record profitability, they have been cautious in their spending. Non-financial S&P 500 companies are sitting on an eye-popping $1.4 trillion of cash at the end of 2013, according to FactSet. Normally companies would invest that money in new projects -- and the new equipment, factories and hires that comes with that. But they don't have the courage of incentives to deploy their cash right now. Despite the fact that stocks climbed to record highs, capital expenditures fell by 4% in the fourth quarter of last year and inched up a meager 0.3% in 2013. That's down from annual growth rates of 10.5% in 2012 and 39.7% in 2011, FactSet said. What little cash CEOs are spending is going into shareholder-friendly moves like stock buybacks that don't do much to stimulate broader economy. "Management teams are now Pavlonian beings. They know exactly how to respond when they get increased cash flows: higher dividends and more buybacks," said Creatura. Income inequality deepens: The uneven nature of the current recovery has only added to the growing problem of income inequality in one of the world's wealthiest countries. Pay data from Equilar shows CEOs now make about 257 times the average worker, up from 181 times in 2009. If there's one somewhat bright spot for Main Street, it's that the recession wasn't worse. And the slow nature of the current recovery increases the chances it can continue chugging along before the inevitable next downturn. "We could potentially see this type of recovery be one that continues for a while and enables those that haven't participated to catch up," said Hooper.